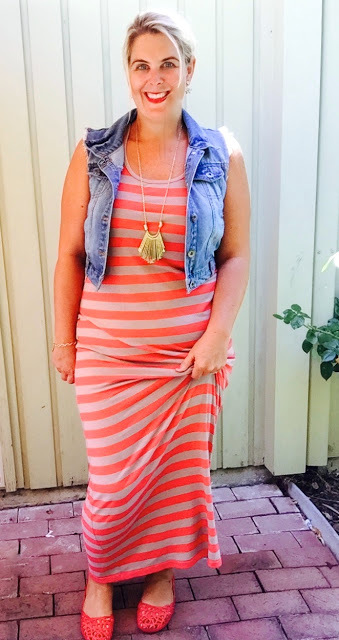 Yummo Mummo | A little striped maxi-dress inspo. There are 53 days left of summer, and I don’t know about you, but I have had a tonne of fun playing around with dresses this season. 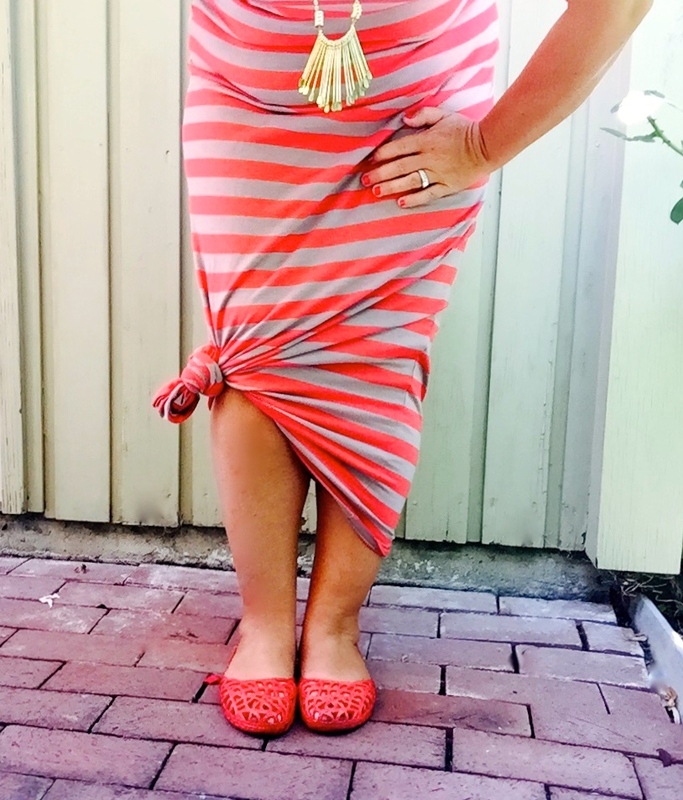 Dresses are a huge part of fashionable summer fun. And it’s our female right to enjoy a great summer dress! Are you ready for this? I picked up this dress in the early stages of my pregnancy (4 years ago now) with my #3rd child. You know that pregnancy, the one where you look 6 months pregnant at 8 weeks. Fast forward 4 years and I am still loving this dress, especially for the length and stretch. I’ve had a lot of fun styling it over the years, so I wanted to share with you some of that inspiration. I’ve pulled in my Coral Mox to pick up the coral stripe in the dress. Perfecto! Read my post on MOX SHOES. The day I took these photos, my car’s outdoor thermometer was 102F. It really helped knotting the hem to allow in extra air up there! LOL! I picked this necklace up at Francesca’s last week when I was shopping for a client. I LOVE it and they had a great BOGO 50% off sale. Bonus! My daughter says it reminds her of little baking spoons. It makes such a gentle jingling sound when I touch it, it’ll be great in the Christmas season! My denim vest – I have pulled it into a million different outfits this season, a definite staple in anyone’s wardrobe. I will have EVEN MORE fun in the Fall with this denim vest as it can so easily be paired with longer sleeved tops etc. I love the coral against the denim blue, great combo. 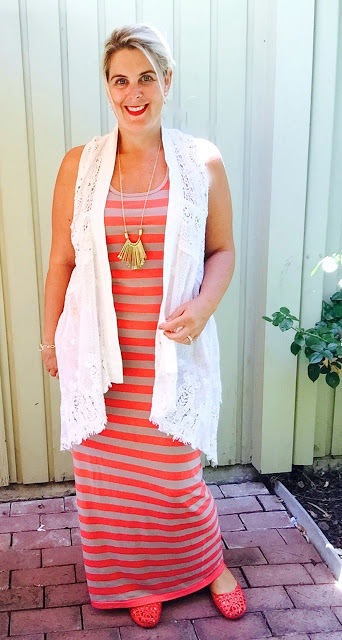 If you follow me on Instagram (www.instagram.com/yummomummo), you would of seen a lot of my daily outfit inspirations pulling in this crochet vest from Anthropologie. I got it on sale about a month ago for $70. Again, I see A LOT more fun in the Fall with this pairing over fall colors, longer tops, jersey dresses etc. Love that! Here is a full length shot of my dress tied at the hem. Add a simple neutral clutch and some fabulous sunnies, and I am ready to go and grab my latte and read the paper in the shade. If you want more maxi-dress inspiration, head back to a previous post where I styled my maxi 12 ways! Click HERE for all the fashionable details. Don’t forget YummoMummo can do wardrobe for you! My website is days away from going LIVE. What excitement! Stay tuned. 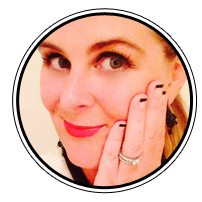 Lovely readers, leave me a comment below……..
« Why I said bye-bye to my scales. Sassy lady! That dress is so cute hun! Love how you paired it with the denim vest. The perfect mix of feminine and tough. Love it! I can never get enough of a maxi dress. Essential! This is so cute, love it!